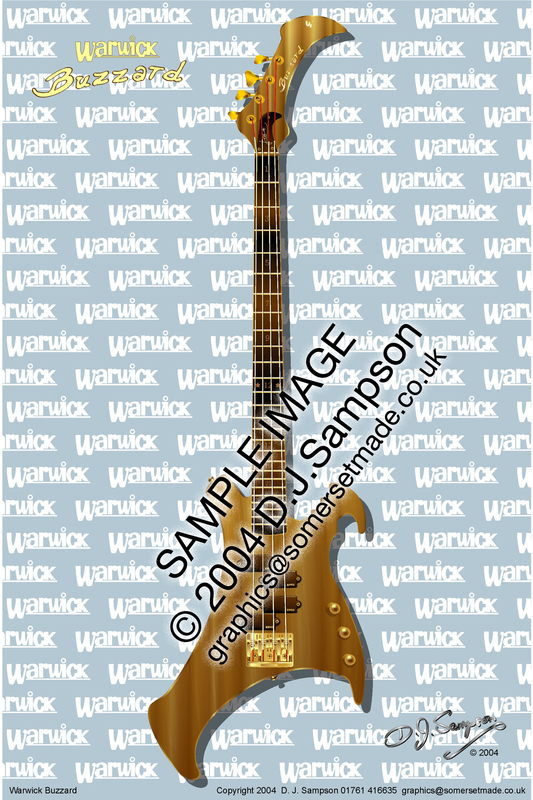 The Warwick Buzzard bass guitar was the brainchild of the late bass legend John Entwistle of The Who. It was designed by Hans Peter Wilfer of the German guitar manufacturers Warwick in 1985 when John asked for help to create a bass based on his unique ideas of how it should look and play. The untamed body shape and neck-through design form a distinctive bass guitar that sounds as wild as its guise. This piece of artwork was commissioned as a birthday present for a bass player who has always hankered after one, but couldn't afford the thousands of dollars needed to buy it. To download the full sized press quality images; right click the hyperlink on your mouse and select Save Link Target As.... Save the image to the relevent folder on your computer.